The K20 Center’s IDEALS framework sets the stage for the ten research-based practices linked directly to high student achievement (IDEALS is an acronym for Inquiry, Discourse, Equity, Authenticity, Leadership, and Service) and has done extensive study and analysis on the effects of digital game-based learning. 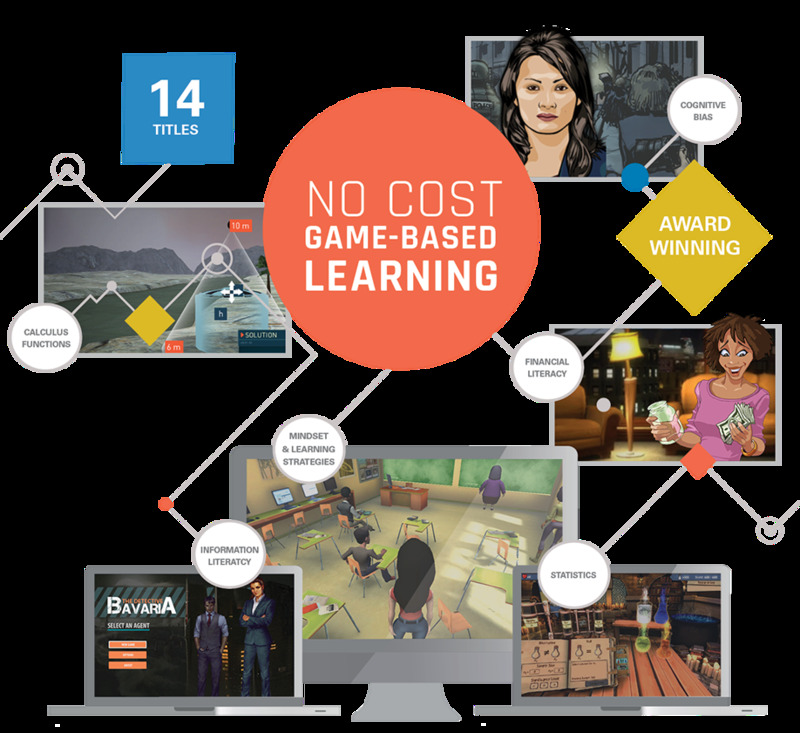 K20’s portfolio includes 14 Serious Games, which have been shown empirically to be more effective than traditional learning tools such as lectures and videos. Through a partnership with OneNet, K20 is now offering these 14 different game-based learning titles at no cost. All Oklahoma schools now have free access to the center's award-winning games. Anyone can request an account to the game portal and the games. Those titles include Mind Your Own Budget, a hands-on way for students to build financial literacy and meet Oklahoma’s graduation requirements. MYOB is made up of ten scenarios, which cover all of the Oklahoma financial literacy standards. 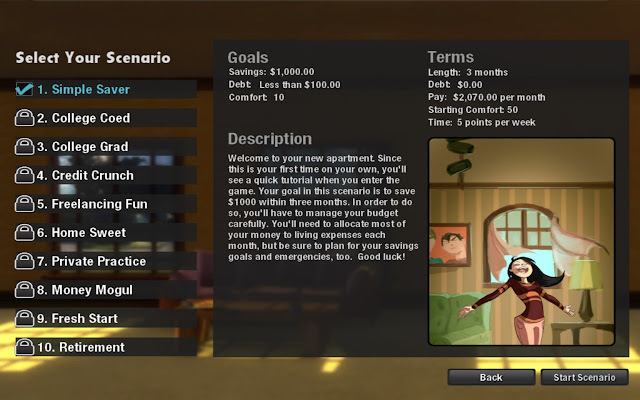 Scenarios range from moving into a first apartment to starting a business, covering real-life situations like emergency expenditures and bankruptcy. MYOB leverages a phenomenon that James Gee (2005) called Cycles of Expertise, which introduces a concept/skill and provides students repeated cycles where they practice their new skill until they have mastered it. 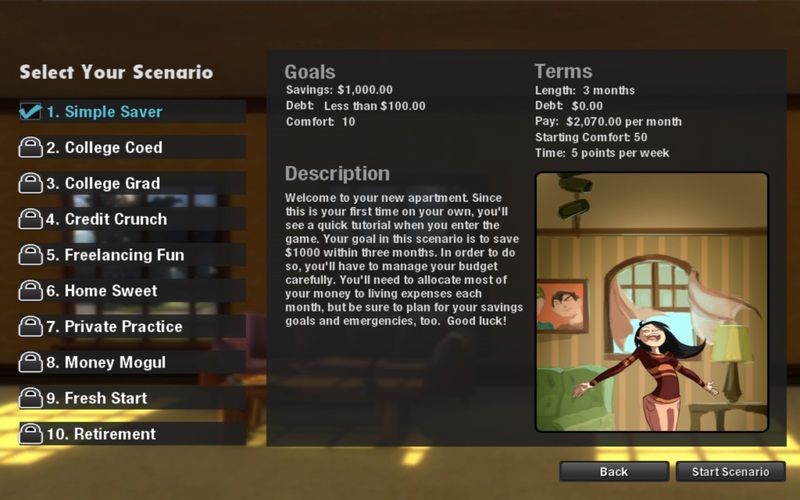 The scenario Simple Saver introduces basic budgeting and savings skills. College Coed adds in taxes, checkbook balancing and savings. In College Grad, students meet loans, debt, insurance and monthly payments. Designed for high school juniors and seniors, Advance U: The Talent Machine, another K20’s title, introduces the concepts of neuroplasticity — the brain's ability to change throughout life — and mindset theory. In the game, a new program has been enacted at McLaren Academy. A machine has been created that measures a student’s natural talents and then determines the job that student is best suited for. Unfortunately, this machine ignores the human capability to learn and grow beyond the limits of their natural talents. To reclaim their educational autonomy and stop the machine from being adopted by more schools, it is up to the students to prove that the TALENT Machine will not work by learning about neuroplasticity and mindset. Object of my prior post MACBETH: Serious Games To Train Future Intelligence Analysts, MACBETH (Mitigating Analyst Cognitive Bias by Eliminating Task Heuristics) is a K20’s award-winning strategy game that puts the player in the position of an intelligence analyst who manages Intel resources and uses information to foil terrorist threats around the globe. 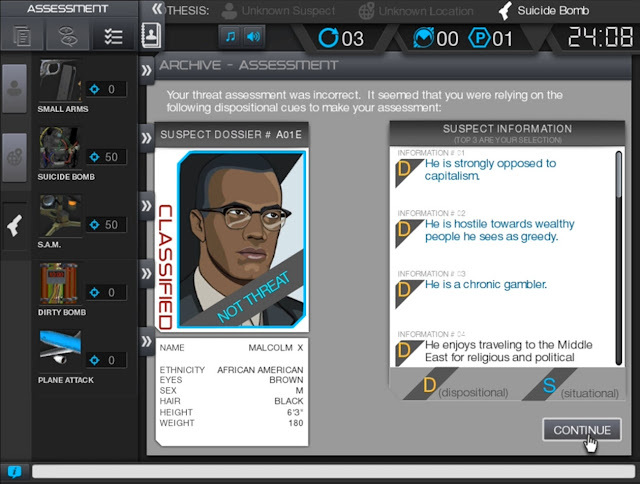 The Serious Game development was commissioned by the Air Force Research Laboratory in support of the Intelligence Advanced Research Projects Activity (IARPA) to train intelligence analysts and measure their proficiency in recognizing and mitigating the cognitive biases that affect intelligence analysis. In 2013, MACBETH was awarded The Best Serious Game in both the Business Category and the Special Emphasis Category – Adaptive Force Training by the Serious Games Showcase and Challenge at the Interservice/Industry Training, Simulation, and Education Conference (I/ITSEC). K20’s game-based learning tools range from one-hour classroom lessons, to an entire curriculum. Best of all, they are available at no cost for teachers and students in Oklahoma. 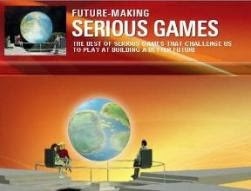 The K20 Center aims to design games that create meaningful learning experiences in a familiar and engaging way. 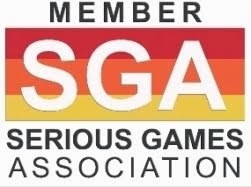 Their process for developing new games begins with extensive research and consulting with subject matter experts to develop content that best meets the educational needs of students while also fostering learning in students. 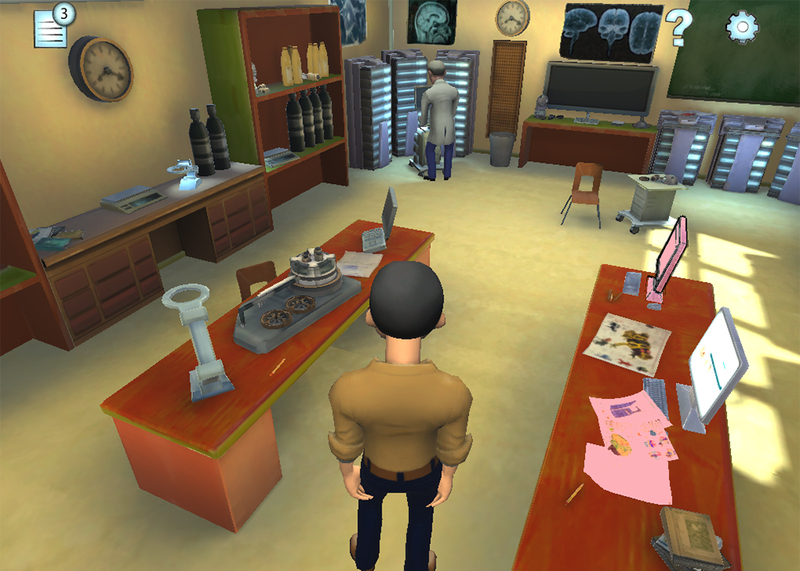 After the content is created, the development process can take several months, as coders and artists work in tandem to create the game. Once a prototype is created, the game is then tested within focus groups. Throughout the process, the K20 Center gathers extensive data and conducts surveys to ensure the content and appearance of the game is as high quality as possible before releasing to the public. 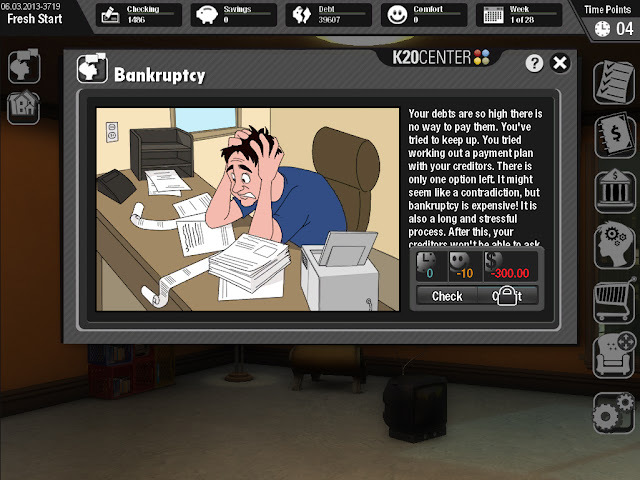 Although the K20 Center had successfully designed educational games that were helping to engage students in important subjects, they still faced difficulties in distributing the content to schools across the state. Many of the game development efforts were supported through research grants, and while these grants helped support the creation of the content, they did not fully cover costs associated with distribution. However, with OneNet’s help, students across Oklahoma can now access all of the K20 Center’s content, and more teachers can incorporate these tools into their curriculum. To help the K20 Center ensure students across Oklahoma had access to their materials, OneNet partnered with the organization to host a virtual server in OneNet’s data center. The server hosts the gaming software and provides students across the state with access to the games. By leveraging OneNet’s existing network, the K20 Center saves substantial time and financial resources. Without the partnership, the K20 Center would have to dedicate staffing resources to ensure proper maintenance of the server, while also paying substantially more to host the games on their personal server.